How did I miss the sizzling colors of Suzanne Anderson? I bumped into her (here’s her blog) as I was browsing through Laura Balombini’s site yesterday. She and Laura are east coast neighbors. I found this recent interview and pictures of Suzanne’s studio in the Bangor Daily News. She gravitated to polymer after years as a beader and metalworker. 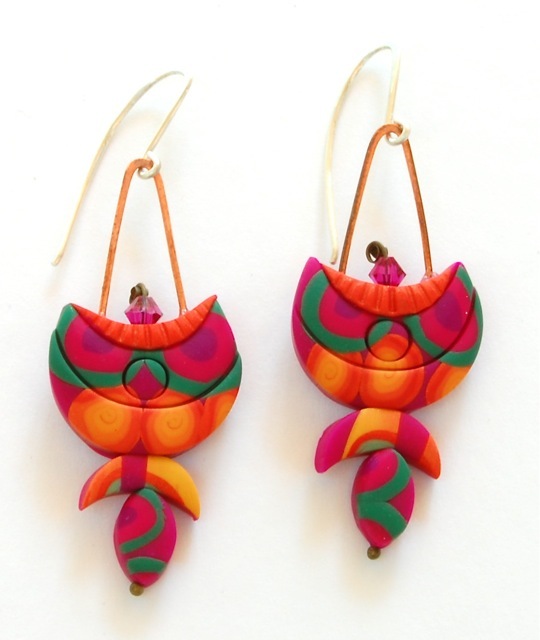 These earrings are from her Fiesta line. I enjoy the way she separates her online galleries by color. Suzanne chose her studio name because the word expresses the upbeat mood of her jewelry…Yikes! Leave a comment on yesterday’s post to enter our first holiday giveaway of our hot-off-the-press Creative Sparks! Wow, loads of lovely comments have come in already. I’ll close entries at 5:00 Friday and choose a lucky winner. The lucky Creatives Sparks winner was Crystal Gordine of Kingston, Ontario. You were all so enthusiastic that we’ll do another book giveaway soon! This is just what I needed today. Something colorful and sizzling. These would look so cool on a little Christmas tree as ornaments. Perfect post to brighten my morning!!! Pantone’s color for 2011 is Honeysuckle…a soft magenta. It looks like Suzanne was ahead of this trend. What gorgeous colors and visually interesting designs! So now we have Yikes! and Yipes! from Joyce Fritz Studios who does the amazing bugs. Love ’em both. Suzanne is my daughter and I am sooo proud of her! I ‘m a polymer clay artist wannabe – just met Suzanne this past weekend at a show we were in . I was so impressed with her work – so colorful and imaginative . She has inpired me sooooooo much. It’s so fabulous how versatile clay is and how everyone uses it in her/his own way. can’t wait to get back to work! Thanks Suzanne, and really nice to have been able to meet you!